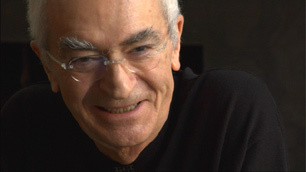 Massimo Vignelli was born on January 1931 in Milan, Italy. Vignelli is a designer who designed many items ranging from package design to house ware design to furniture design to public signage to showroom design through Vignelli Associates. He cofounded Vignelli Associates with his wife Lella. His famous line is "If you can design one thing, you can design everything." The line reflects his broad range of work. When Vignelli was a teenager, he became interested with design. He studied architecture at the Politecnico di Milano and later at the Universit� di Architettura in Venice, Italy. Vignelli visited America on a fellowship in 1957 to 1960 and returned to New York in 1966. He went to America to start the New York Branch of a new company, Unimark International that quickly became one of the largest design firms in the world. 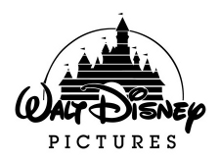 The firm designed many recognizable corporate identities to date such as American Airlines (which forced him to add the eagle). 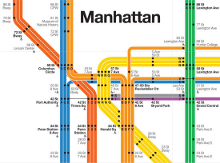 He also designed the look for the New York City Subway System and the intriguing but controversial 1970s-80s map of the system. Even though it may seem like he designed the Washington DC Metro Map, he did not. It was actually designed by Lance Wyman and Bill Cannan. Vignelli designed the simple look and way finding system for the DC Metro and was the one to suggest that it be named "Metro" like many other capital city subways. Vignelli resigned from Unimark in 1971. He left because the design vision he had become diluted as the company diversified. Soon after he and his wife founded Vignelli Associates. Vignelli worked in many different areas such as interior design and package design. His clients at Vignelli Associates included many well-known companies such as IBM, Knoll, Xerox, Lancia, Cinzano, Ford Motors, Bloomingdale�s, and American Airlines. The company also designed glassware for Venini, Steuben and Sasaki, and showrooms for Artemide and Hauserman. Vignelli also turned his attention to designing furniture for Sunar, Rosenthal, Morphos and Knoll, including the well known Handkerchief Chair and Paper Clip table for Knoll. The Vignelli's are extremely versatile designers whose work is distinguished by clean, bold lines and a confident use of pure color.